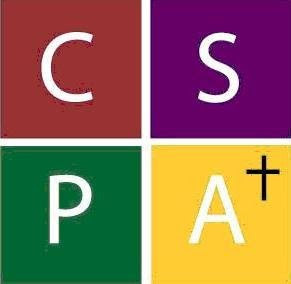 The CSPA meeting is scheduled for 7:30 PM on Wednesday, September 28, 2016, in the OCSB Boardroom, 570 West Hunt Club Road. 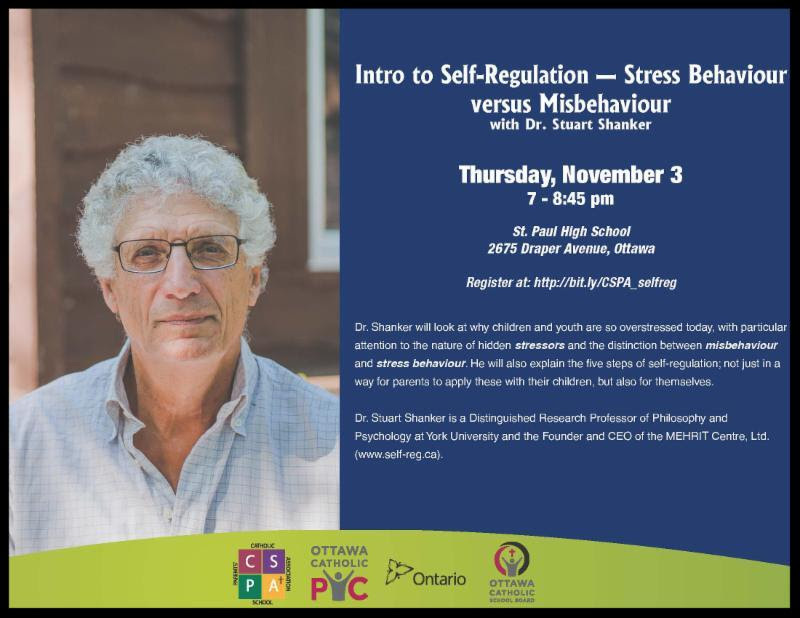 All school council members, parents/guardians of OCSB students are invited to attend. 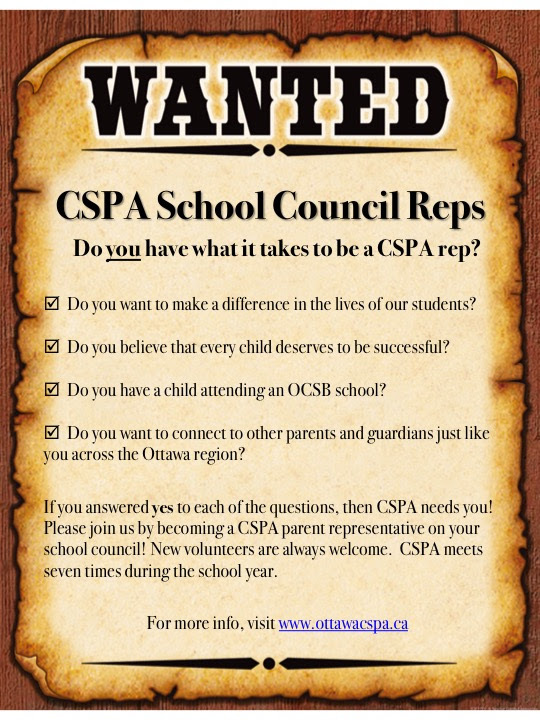 We encourage all schools to send a representative, even if a CSPA rep has not yet been elected. parents to apply these with their children, but also for themselves. We're beginning planning for the next school council information evening we affectionately call "Boot Camp for School Councils" and we're looking for your input! What are the key questions or challenges you would like to have discussed? Please take a moment to answer our 2 question survey! The location for Boot camp is still being decided. Hope you will join us on Nov 7th! Thank you to all parent volunteers who served on CSPA Executive last year. Your work behind the scenes is much appreciated! CSPA Executive elections will take place at our October 26th CSPA meeting. If you would like to share your time and your skills and are interested in specific education issues, or in getting a broader board-wide perspective of Catholic education, consider joining our team. We meet at 5:30 PM before our general CSPA meetings. 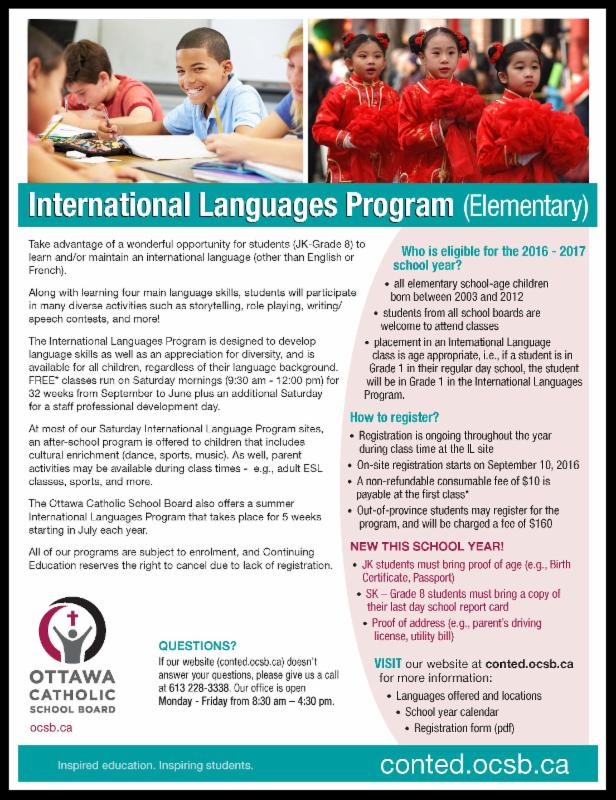 The International Languages Program is open to all children regardless of their language background. More than 20 languages are offered in this FREE program. Take advantage of a wonderful opportunity for students (JK-Grade 8) to learn and/or maintain an international language (other than English or French). NEW this year! We have joined the Ontario Association of Parents in Catholic Education (OAPCE) and in keeping with Ministry of Education policy, all OCSB councils must elect an OAPCE Rep. To keep it simple, your CSPA Rep will also be your OAPCE Rep. No additional work is anticipated. Visit OAPCE.org for more information. The OCSB School Council Annual Financial Report for the period September 1, 2015 to August 31, 2016 is due by October 12, 2016.